When you're writing a cover letter, the layout and format of your cover letter are important. A cover letter template can help you format, layout, and design a professional cover letter. You shouldn't have to pay for a cover letter template. There are plenty of free, reliable templates available online. Read below for cover letter templates you can use to create your cover letter, cover letter examples, and tips for writing a strong cover letter. Because a cover letter is often an employer’s first impression of you, it is important that yours is professional and polished. Your cover letter needs to be visually appealing, properly spaced, and well-written. A template can help you structure your letter so that it is well organized. Finally, a template simply helps save you time. A template gives you a suggested structure for your letter, so you can quickly start writing. A template helps you with the layout of your letter. Templates also show you what elements you need to include in your letters, such as introductions and body paragraphs. You should use a template as a starting point for your cover letter. However, you should always be flexible. You can change any of the elements of the template to fit your own needs. For example, if a letter template only has one body paragraph, but you want to include two, you should do so. Send one. Even when an employer does not directly ask for one, be sure always to send a cover letter. The only time you don’t want to send one is when the job listing says not to. Customize each letter. 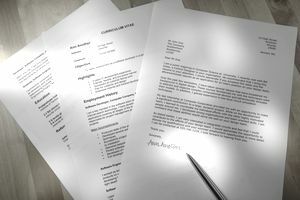 It might seem tedious, be it is important to customize each cover letter to fit the specific job you are applying for. It will make your letter stand out. Highlight relevant qualifications. In your cover letter, address one or two skills or qualifications that you have that match the job description. Provide a specific example of a time you demonstrated each of these qualifications. These examples will make your cover letter different from your resume, which is important. Explain any potential issues. You can use your cover letter to go into detail about something in your resume that needs explaining. For example, a cover letter is a good place to talk about a career shift or explain an extended gap in employment. Carefully edit your letter. Be sure to edit each cover letter before sending it thoroughly. Consider asking a friend or family member, or a career counselor, to read over your cover letter. Read below for a variety of cover letter templates you can personalize to create your cover letters when submitting job applications. Here are examples of cover letter mail and email formats to review, including formatted targeted cover letters, general cover letters, letters of interest, and email cover letter messages. When writing a cover letter, the layout of your letter is important. A clear layout makes it easy to read and helps it look professional. It's important to properly space the layout of the cover letters you send, with space between the heading, the greeting, each paragraph, the closing, and your signature. Along with helping with your layout, cover letter examples can help you see what kind of content you should include in your document. They can also give you ideas on the type of language you want to use. For example, a sample cover letter might show you the kind of action words you should include in your cover letter.